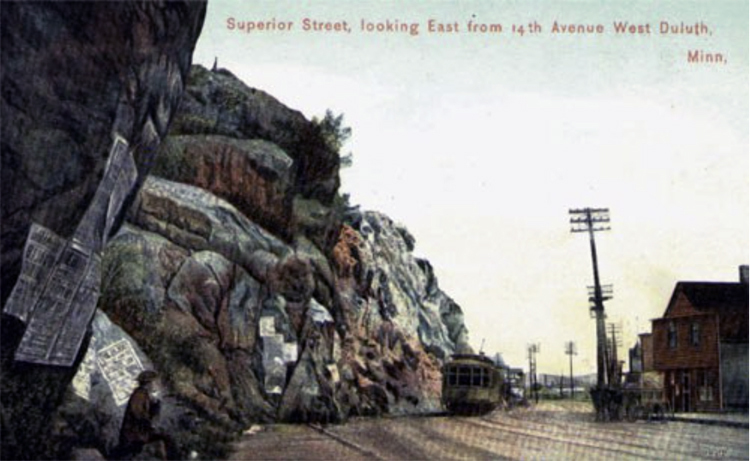 Since 1887 Duluthians have been chipping away at Point of Rocks, a giant rock outcropping near Thirteenth Avenue West and Superior Street. Early attempts to remove the stone were spurred both by safety concerns and in order to make Superior Street straight. Shortly after the first blast in 1887, a huge boulder narrowly missed a man on horseback. In 1924 a movement grew to remove the natural landmark after 100,000 tons of rock fell onto Superior Street (another 100,000 tons fell in 1931 after heavy rains). Duluthians found a use for the Point: both painted and handbill advertisements found their way onto the stone, as the postcard above attests. In 1919, city leaders decided to turn Point of Rocks into a work of art. They brought in Mount Rushmore sculptor Gutzon Borglum to blast the rock into the form of the city’s namesake, Daniel Greysolon Sieur du Lhut. But Borglum found the stone too hard to carve and refused the job. (A bronze statue of du Lhut by famed sculptor Jacque Lipschitz stands in UMD’s Ordean Court.) Despite blasting and plans for public art, Point of Rocks remains—albeit smaller—and Superior Street still bows around it.